I’m Cristy Stuhldreher of Love You Sew and this happens to be my very first post as a member of the Blank Slate Patterns Sewing Team. I love athleisure style and am SO happy it seems to be sticking around for awhile. My Denver Tunic (aff link) fits with my busy lifestyle, and I’m excited to share these athleisure-inspired hacks with you! It’s the season of giving and thinking of others. While busy thinking of the needs of my family and friends, I can’t help but also think about some self-care and treating myself a little bit. 😉 (Especially, since I had a miserable sinus infection while shooting these photos!) As much as I would love to gift this tunic to one of my friends, I had to keep it for myself! Running around with young kids and maintaining a sewing business does not leave me with much time for wardrobe selection. I tend to fall into the leggings and a loose top category as my daily uniform (because that’s what’s clean in the unfolded laundry basket.) 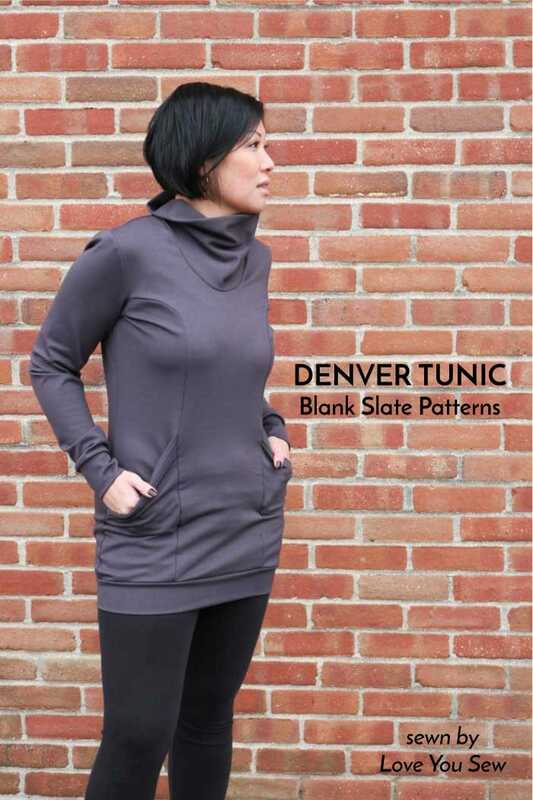 So when I saw the Denver Tunic, I thought it was such a sleek alternative to just a regular sweatshirt or long-sleeve knit. The contoured front panels give you great options for color-blocking, but I opted for just a solid look with this a-mazing slate gray Ponte de Roma from Imagine Gnats. And can we discuss pockets?!? 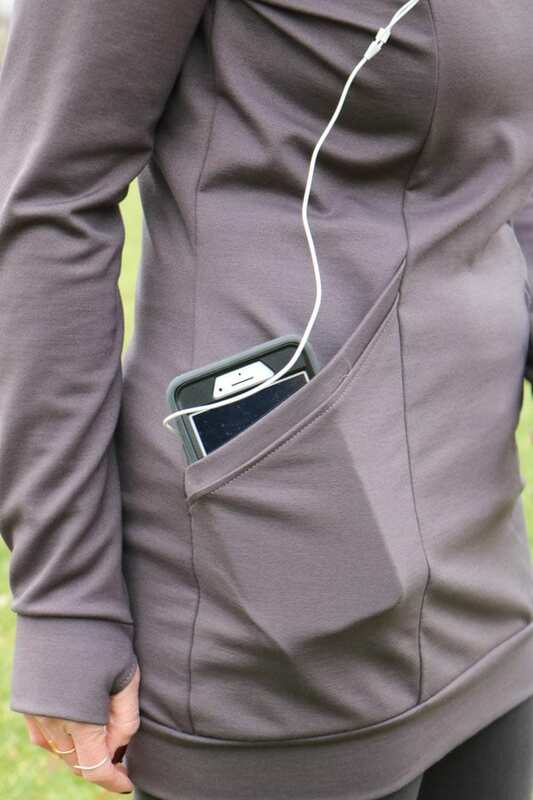 When you are a busy mom/lady boss/runner/human being, you just need pockets in your life. The slanted design is such a beautiful feature which gives you utility to hold your phone, keys or just about anything else. I love how deep the pockets are and how they are closed off by the hem band. Today’s athleisure trends show high necks for those who take their activities outdoor. I love this look with the volume and you don’t have to carry around an extra scarf to stay warm. However, when you move indoors and are sweating, you need a little relief. 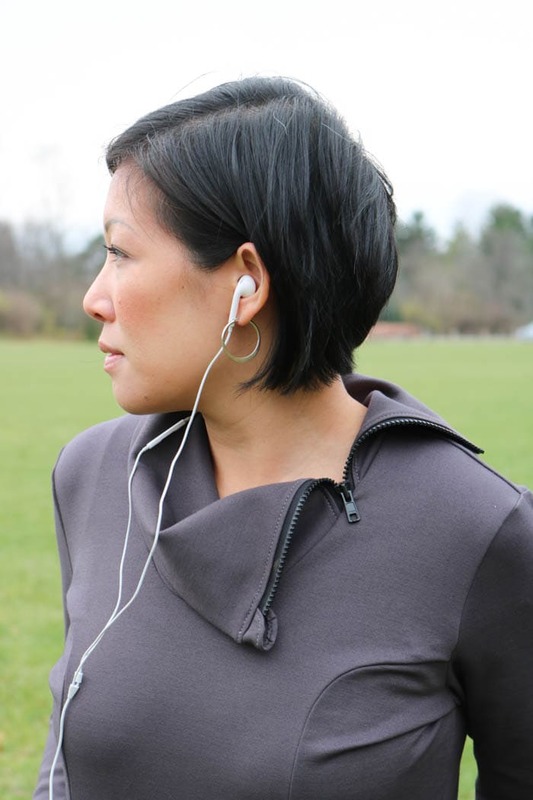 The cowl neck option in the Denver Tunic was perfect to hack with a zipper in order to open that neck for breathability. 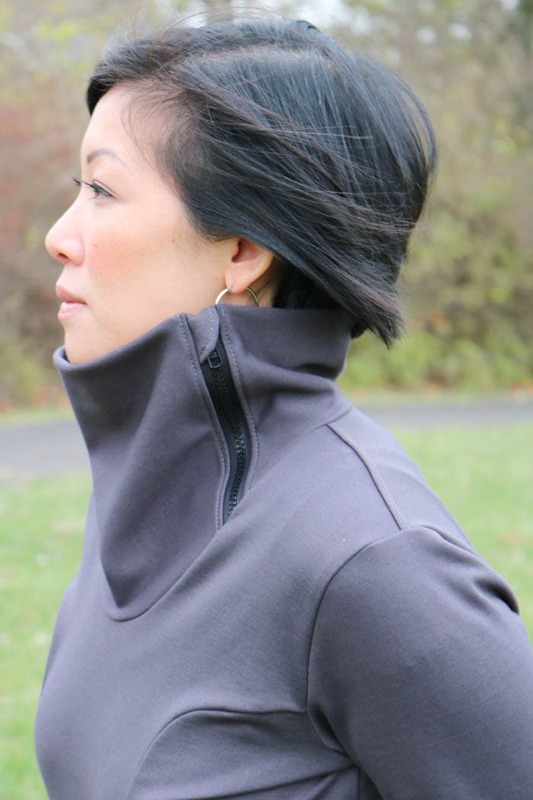 When open, the neck collar has such a fun asymmetrical look that keeps you styling. I cut the cowl neck pattern exactly as the pattern is drafted for my size (medium) and marked the middle of the cowl lengthwise (also known as the fold-line) to give me a guide as to where the top of the zipper should be placed. From the edge of the short end, I measured 7″ in and cut the cowl into two pieces so I could insert the zipper. Since I used a wide polyester “sport” zipper, no additional seal allowances were needed. I added in a half-circle “scratch guard” with some scrap fabric at the top of the zipper and it really gives the zipper a professional feel. 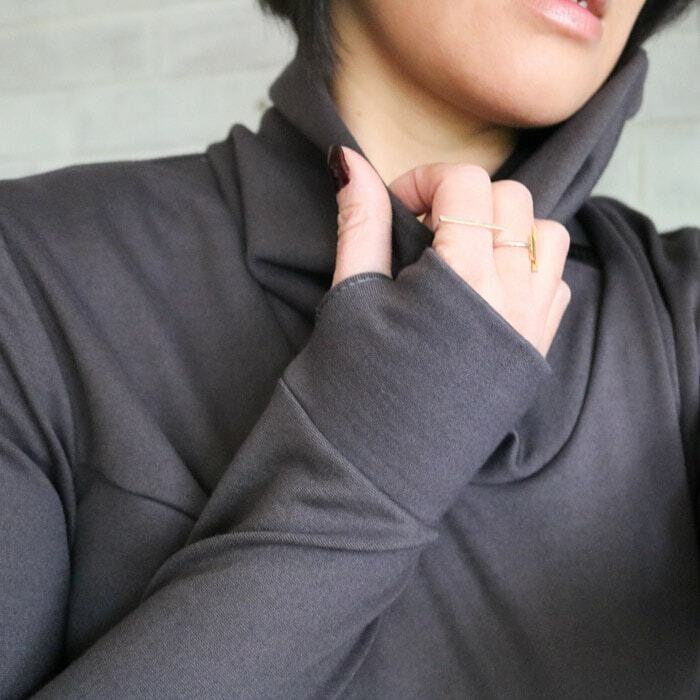 Almost all athleisure tops have their signature thumb hole cuffs, so I knew I had to add one in as well. Make sure when you sew in your cuffs, the seams are pressed open inside (no serging or zig-zag finishing.) Line up the cuff seams and pin into place. Sew a box approximately 3/4″ from the cuff’s opening. The box should be about 1/8″ from the seam and 2″ long made with a tacking stitch or just repeating the box 2-3 times. Carefully, unpick the stitches and voila, you have a thumb hole. I’m petite, so the sleeve length and cuff length were long enough for me, but you may want to adjust if you are taller. Although I came into this make with more of a sporty approach, athleisure is a main part of today’s street style. This tunic isn’t reserved just for leggings and a pair of sneakers. My days of high heels are pretty limited nowadays, but I know many would wear this same outfit with some sky-high stiletto boots. I, however, have opted for my moto boots to make this an everyday look. Some skinny jeans and ankle booties would also make a great date-night outfit. How would you style this Denver Tunic? Thanks for checking out my post and I hope you take time to treat yourself this season!